You Will LOVE this Mid-Century Home with Pool and Spa! A PERFECT Vacation Home! For those few days or few months when you want to be close to everything but far from the maddening crowds…this updated mid-century modern home located in a quiet neighborhood of Rancho Mirage, allows just that. The 2bd/2ba & den, with its private pool & spa, has been professionally decorated and equipped to provide for your tranquility, while being within easy access to any desert amenity you choose. Wake up to fresh ground coffee, stay in touch with back home through high speed wi-fi, free Canada & US phone calling, and a wireless printer/scanner. Or jump in the pool and practice your backstroke while the palm fronds sway above you. If you decide to venture away from this peaceful oasis, its central location means nothing is more than a chip shot away – golf courses, the Bump ‘n Grind, El Paseo, etc. For meals, whip up something tasty in the completely outfitted kitchen, grill outdoors on the barbecue, dining al fresco under the twinkling lights of the solar powered umbrella, or stroll over to Restaurant Row where you have your pick of cuisines. Catch a movie on one of the twelve screens at The River complex, or stay in and see what’s playing on one of the four LCD televisions. At the end of the day as you relax in your home away from home, with the flames dancing in the fire & ice fireplace, you’ll be reminded that this, indeed, is living. Welcome to your vacation. Enjoy. The owners are animal lovers and will consider a dog. Please inquire regarding pet policies prior to reserving this property. Landscaped patio area featuring full-size private pool and spa with high efficiency equipment. Large master bedroom which opens on to the patio, and features king bed, and luxury en-suite with large dual-head shower plus dual sinks, and walk-in closet. Free USA & Canada long distance calling. Two car garage plus large driveway with room for RV. Pool and grounds are professionally maintained. This is an EXCELLENT place to stay for a quiet and restful vacation. The hosts are awesome and communicate extremely well. I would highly recommend this place and am already eager to come back to it soon. 5 stars and excellent service! Thank you Vacation Rentals of the Desert! The house is in a great location and in central to a variety of stores, restaurants, hiking trails, and more. The entry and departure process was smooth and seamless. The kitchen was well appointed with everything one would need for their stay regardless of duration. The beds and bath were comfortable and adequate. The pool warm and got lots of sun. There were two trees that provided shade in the pool throughout the day if desired. Thanks to the ladies at Vacation rental of the desert for making our stay a wonderful one. We loved everything about this place, from the decor, the pool, spa, the bedroom just everything....wonderful. I took my husband along with my daughters and grandson to celebrate my husband's birthday. We had a amazing time. So close to everything, shopping, restaurants, movies, the Zoo..etc etc. Comfortable & cozy house, very well-stocked!. The property is exactly as advertised. Very well appointed and comfortable. My wife and I enjoyed our stay here very much. Very conveniently located and in a wonderful quiet neighborhood that made it impossible not to relax and unwind. The only suggestion I would have for the owner would be to provide a portable umbrella stand so that the umbrella on the table could be moved to provide some shade while lounging around the pool late morning to mid-afternoon when no other shade is available. My husband and I stayed at this house for five wonderful nights. The house was exactly as advertised, and we couldn't have been more pleased. The living area and master bedroom has direct access to the pool, spa and patio. The awesome outside lights allowed us to spend more time outside than in. The kitchen was well-equipped. The house's location made getting to stores and restaurants so easy- many were walkable. I highly recommend this house in Rancho Mirage! Thanks for your professionalism and your hospitality and your friendliness. The team was friendly and attentive. Customer Service is hugely important to success and this team knows how to deliver. A HUGE thanks for a great experience! Great stay at a great property! Thanks to the whole team for helping to make our vacation a great one! Vickie and Kathy were very accommodating to our request for a creative arrival and departure! Knowing we were coming extremely late from San Diego, they ensured the lights were on and the property was accommodating upon arrival. They then allowed us a late check out since we arrived so late. Very thoughtful touches! My wife and I were looking for a private getaway with outdoor pool, spa, jacuzzi with a flowing open house plan in a nice neighborhood. The VRD staff was very helpful and found the right place for us at the right price! They are pleasant to work with and were patient answering our questions regarding the contract, the property, and the area. We look forward to working with VRD again in the future!! This was a great experience. 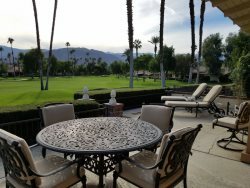 We own a timeshare in Rancho Mirage and love this area! However, we wanted to get away for a private and romantic getaway with no crowds. We wanted a 2br, 2 bath single family home with an open cheery floor plan, great kitchen with all the amenities, private pool, spa, outdoor bbq and big screen cable/DVD player all in a nice neighborhood! This home fit the bill!! Enjoying ice cold margaritas by the pool and spa, enjoying reading on a lounge chair or having fun in the pool all in complete privacy in a quiet neighborhood.....We just hope this home stays on the list. Just what the Dr ordered!!! We'll be back! All your staff was great. We dealt with Kathy, Vicki and I think Trish?? You all made us feel welcome, at home, and like family. Every person and conversation was very pleasant and accommodating. You guys understand what customer service means, and how important it is to make people feel like they are not inconveniencing you, that you want them to be comfortable and to come back. And thank you so much for the late check out too. It made all the difference in the world to not feel rushed that last morning where we wanted to just enjoy those last few hours while packing out. We will be back!! We really loved this place and enjoyed ourselves. We were really able to just relax. Never felt like we needed to go anywhere...Loved the kitchen and cooking indoors and out with the BBQ. The kitchen accoutrements were far more than we ever expected in a rental home, the best we've ever had anywhere traveling all over the US and Europe. Really incredible to have top of the line knives, cook pots, utensils, mixers, e.a. Thank you again for a wonderful experience.